Beekle looks part Michelin man, part marshmallow and is completely, unassumingly adorable looking…and imaginary (or rather unimaginary). After waiting and waiting and imagining what could possibly be taking his special friend so long to choose him, Beekle finally decides to take matters into his own hands. He ventures out in epic fashion into the real world where no kids are eating cake and no one stops to hear the music. He searches, finally climbing to the top of a tree, but nothing happens- until it does. He hears a noise below; a girl who yells hello. At first there is awkwardness, but then the two realize they are perfect for each other. They go on adventures together and suddenly the world seems a lot more imaginable. Caldecott medal winner, Dan Santat climbs inside the mind of a child and writes and illustrates a beautiful story. 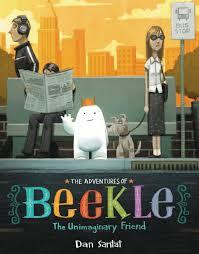 Beekle is tiny, but mighty as he braves the unknown to find someone who doesn’t even know he doesn’t exist yet. Santat is effective in showing uncertainty and differences of the unknown. Our protagonist, because he persists finally finds his friend that he always believed belonged with him. Picasso once remarked that “every child is an artist. The problem is how to remain an artist once we grow up”. Beekle is a triumph and it is pleasing to see that the author has remained an artist into adulthood and that with a little imagination, we can too. In my house there have been many requests for a new pet, so much so that this is how it now goes “If I get a fish and am responsible, then can I get a mouse and then a hamster, then a guinea pig, then a bunny and work my way up to a dog?” I am always steadfast and unwavering in my reply. No. The girl in the book also asks her mother, but her mother’s parameters are not quite as strict. As long as it doesn’t need walked, bathed or fed, her mother agrees. The girl, smart little thing, heads to her library and the librarian hands her a book holding the key to her pet destiny- enter sloth. 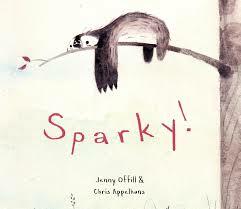 Enamored and excited about her new pet, the girl can’t wait to see all Sparky can do. She tries to teach him tricks, play games, but Sparky is well, a sloth and so he does not exactly excel at anything besides statues and being quiet. A neighbor girl, Mary Potts has a cat who can dance on its hind legs. Perhaps a little prematurely, the girl puts up a poster announcing a sloth extravaganza, which will highlight all the new tricks Sparky has learned. Needless to say, things do not go as the girl plans. After the event, deflated, the girl hands Sparky a cookie, then takes it back because he takes too long to eat it. The book has a wry humor, but it’s hilarious in very subtle ways. The illustrations complement the text fabulously and this is a book you could pick up again and again. Offhill takes droll to another level! It isn’t easy playing second fiddle-especially to a Unicorn! I mean, the myth, the horn, the ability to fly and make it rain cupcakes! Goat is upset because before Unicorn, everyone was content with his marshmallow squares that he almost got right one time. They seemed to really enjoy the old “pulling the quarter out from behind your ear trick,” until SOMEONE could turn stuff to gold! The book takes a turn when unicorn discovers goat cheese pizza and it’s delicious, or that cloven hooves are actually really cool because unicorns’ regular hooves are well, boring- they can’t climb to the tops of mountains! 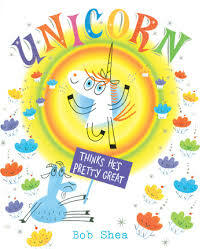 Unicorns’ horns are good for nothing but “pointing,” unicorn finally admits. He also can’t play soccer, (for obvious reasons). The two decide to pair up and become an unstoppable team because they play to each other’s strengths and accept the traits they don’t have themselves. Shea’s book is great for many reasons. If you have or know young siblings, you can help teach them that they both have different skill sets, but are talented in some way nonetheless. This is a great picture book for young readers and teaches adults a thing or two. Roget and his Thesaurus is the biography of the man who helped make sure we find exactly the right word we are looking for in any given situation. When Peter Mark Roget, pronounced “Roh-Zhay” was a small boy, his father passed away and to help make sense of the loss, Peter felt the universe made more sense when he made his lists. At first the lists were simple- Latin words he’s learned from his tutor, with their meanings right next to them. But then, they became more detailed “and when he put them in long, neat rows, he felt as if the world itself clicked into order”. He learned of the great Linnaeus, botanist, physician and zoologist and how he, too enjoyed categorizing things into lists. The illustrations in this part of the book are just beautiful. It reads as part children’s Encyclopedia, part Pandora’s Box. The author does a fantastic job of presenting Roget’s early life and then into adulthood. Roget shows us how a chaotic world can become more sane and manageable when there is order. Find this in the Biography section of Children’s. We have read The Day the Crayons Quit (2013) again and again in our house. It just never gets old. At first, it’s really just acquainting yourself with all of the colors of Duncan’s crayon box via their personalized letters to him citing the specific reasons why they are going on strike- orange and yellow are caught up in a conflict of who is actually the real color of the sun; white is at odds with herself because she never shows up on the page; pink would prefer not to be gender stereotyped; purple is slightly OCD with staying inside the lines; red, despite working hard drawing fire engines, apples and strawberries, is fed up with having to go into over-drive for holidays churning out Santa’s and Valentines. Perhaps one of my favorites is poor old peach, whom has been shown such little regard that her jacket had been peeled off, leaving her naked and embarrassed in the crayon box. This may be one of the very few works of children’s literature that is so successful in empathizing with the very first drawing implements most children ever get in their hands. A great read for preschoolers and early elementary aged children. If you read the first Crayon book, you may as well go ahead and invest in the second (they make a great pair). In the second book, another group of Duncan’s crayons are at odds with him, for varying reasons. From maroon, who was lost in the couch and broke in half because he was sat on, to neon pink who was left by the hotel pool and making its way back via New Jersey and the North Pole. His crayons make emotional pleas for Duncan to bring them back home. Orange and yellow, who were once arguing over which one was really the color of the sun, were left outside by Duncan and melted together and discovered the real color of the sun-HOT! Daywalt has written another funny installment that is well worth reading. For preschool and elementary aged children.